I'm a little confused – did you eat the chips or not? You said you didn't open them but then you say you drink a lot of water, indicating that it might be as a result of the salt in the chips. Not trying to nit-pick (I love your blog! ), but it is a a little confusing. It does look good. I've never been a big fan of the fruit jello. But this meal does look like something I could eat if I had to. I think I would miss having everything on a real tray with the option to mix my food or eat everything separately. good point, I added more info. Thanks! It sounds as if the better and slightly more healthful options are the meatless days. For some reason it looks as if the food is improving slightly. The patties and the pizza appear as if they should be avoided. My sons school has fairly similar fare but i must say the bean and cheese burrito is decent and is served with corn and an apple which is somewhat satisfying. He eats on bean and cheese burrito day and pizza (ugh) day. Keep up the good work. @ashley schoolar: I don't understand your comment. Are you considering today's meal "meatless"? Do you not count turkey as meat? And you say that it seems that the pizza appear as if it should be avoided, but it seems that the pizza is a meatless meal. It doesn't appear that there is meat on it, anyway. Ok so does the fruit jello count as the fruit and dessert? Talk about minimizing to save money, haha! When I eat stuff like this I like crumbling the chips into it for some texture. And you can eat everything faster. I love making something similar to this at home. Looks yummy. Awesome blog. I really enjoy seeing what you eat each day. Keep the posts coming. 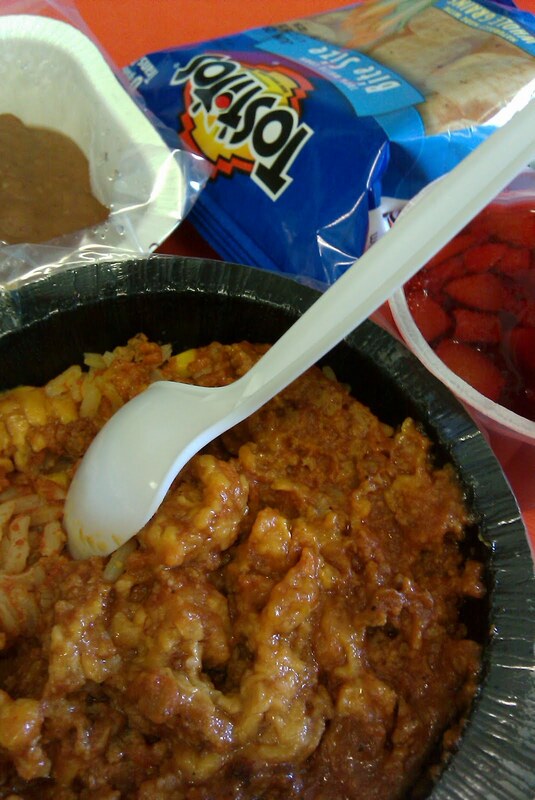 I didn't know schools cooked this many different meals! Not sure if this is what Ashley meant, but a lot of people don't think of poultry as meat, just beef and maybe pork. I'm vegetarian and get asked all the time if I eat chicken and/or fish. Today's lunch looks pretty good – the beans definitely look less disgusting than last time they were served! queenscook; I am merely stating that the meatless options (bean and cheese burrito, etc) 'appear' to be more tasty. I made no mention of todays meal being meatless if you wanted to go back and reread what i stated. Why did you not leave a message for Mrs Q instead of combing through my message? Seems trite. I don't want to be gross…but I have to be. That looks like vomit (rice stuff), diarrhea (bean stuff), and animal organs stored in blood (fruity stuff) served with a bag of chips. It may taste good, but it looks quite awful from here. PS Congrats on getting "Blog of Note" for the day. Not sure when it happened, but your blog now has over 500,000 hits as well! Milestone! Hi, I just happened on your blog through scrolling through the blog of note! What a great idea–I love it! Well written and interesting information Thanks! Looks good. Wish there was a side of a vegetable of some sort. Or maybe a bit of salad. I'm glad this meal was tasty, but I am disappointed in the nutrition aspect. As a type 1 diabetic, I would not have been able to eat this meal as a child. The carb count (and probably the fat count as well) on this meal is just appalling – rice, corn, beans, corn chips, jello, and fruit are all loaded with simple carbs. A healthier alternative would be to remove the corn from the tex-mex bowl, to replace the simple white rice with beans (black or pinto would be nice), to replace the refried beans with a REAL vegetable … maybe a green salad as another person suggested, and to replace the jello cup with a REAL piece of fruit. I think eating the schools lunch is very adventurous. I work in a public school in the midwest and wouldn't dare touch the pre-packaged food, plus I don't eat pork, so I don't need any surprises. Hopefully, your blog will garner the attention it needs to get healthier meals into schools. Some of your snapshots look way better than the meals they serve here. Hi Mrs. Q–just stumbled upon your blog from the Blogs of Note. I just wanted to let you know that you are doing a brave thing! My mom came in and ate lunch with me one day when I was in first grade. I believe it was chicken nuggets with some kind of weird sugar sauce. From that day until I graduated from high school, my mother made me a balanced, healthy lunch every single day. Good luck with your project! I hope you can effect some change in the system! The Tex-Mex would be so much more appetizing to me if it were just served in a real bowl. I'm not so sure the sodium in the chips is to blame for your thirst Mrs. Q. I bet the Tex Mex turkey and beans are loaded with sodium, too, as all processed foods are. It covers up a multitude of sins. I still think the beans look like chocolate pudding in the photo! 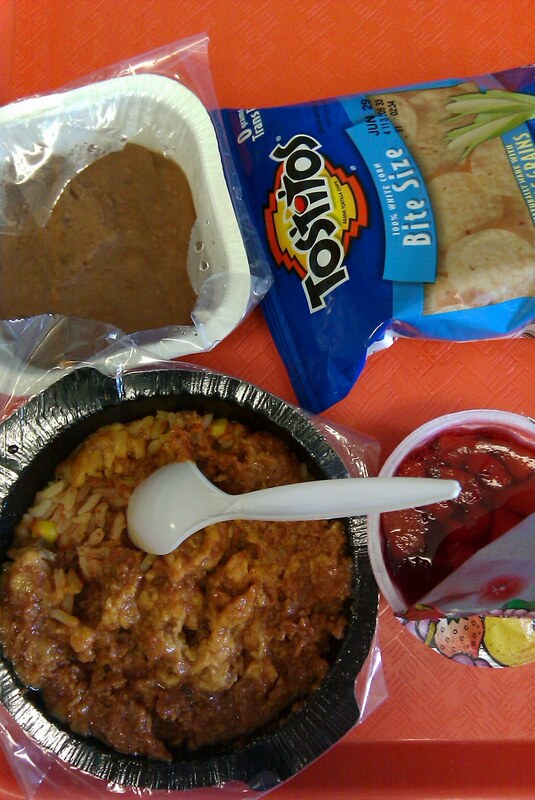 Our kids get two options for lunch, like turkey and cheese sandwich or beef and cheese nachos. The sides are the same, only the main dish varies. Kids have to "order" lunch on a tally sheet in their classes each morning. That way, the cafeteria knows how much of each entree to make. I still don't understand how fruit jello can be considered a full fruit/veg portion. Congrats on being Blogger's Blog of Note! Well deserved. How is jello fruit? All it is is dye and sugar!